A spectator has been charged with attacking Aston Villa midfielder Jack Grealish on the pitch during the Championship match at Birmingham City. Grealish was hit by a man who came on to the pitch about 10 minutes into Sunday's derby. Paul Mitchell, aged 27, of Rubery, Worcestershire, has been charged with encroachment on to the pitch and assault, West Midlands Police said. He is due to appear at Birmingham Magistrates' Court on Monday. Villa captain Grealish sat on the St Andrew's turf before being helped up by players from both teams and was able to continue. His side went on to win 1-0, with Grealish scoring the winner in the 67th minute. The Football Association said it "strongly condemned the incident", adding it would be "working with the police, the relevant authorities and the club to ensure the appropriate action is taken". 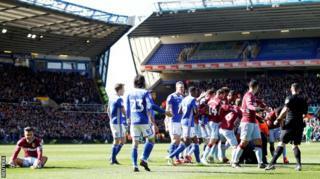 Birmingham City apologised to Grealish and Villa immediately after the game and added it would be reviewing its stadium safety procedures. The club also said the individual involved would be banned from St Andrew's for life and there were "no excuses" for the behaviour. West Midlands Police said it was also investigating "offensive social media posts" after a Twitter user referenced Grealish's late brother, who died when the footballer was four. Sunday also saw a spectator arrested after running on to the pitch and shoving Manchester United defender Chris Smalling during their loss to Arsenal.